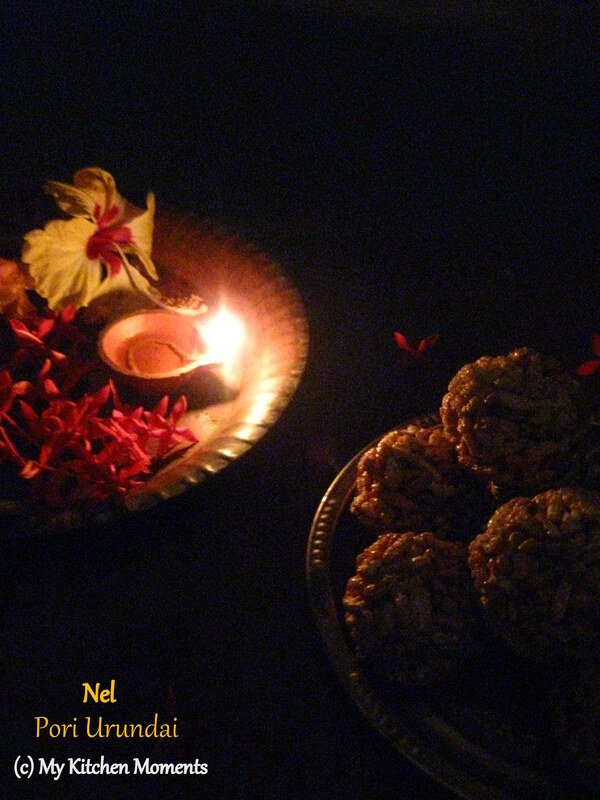 Nel Pori Urundai aka Puffed Paddy Rice balls with jaggery is one of the traditional neivedhyam dishes prepared on the auspicious occasion of Thirukarthigai / Karthigai deepam. 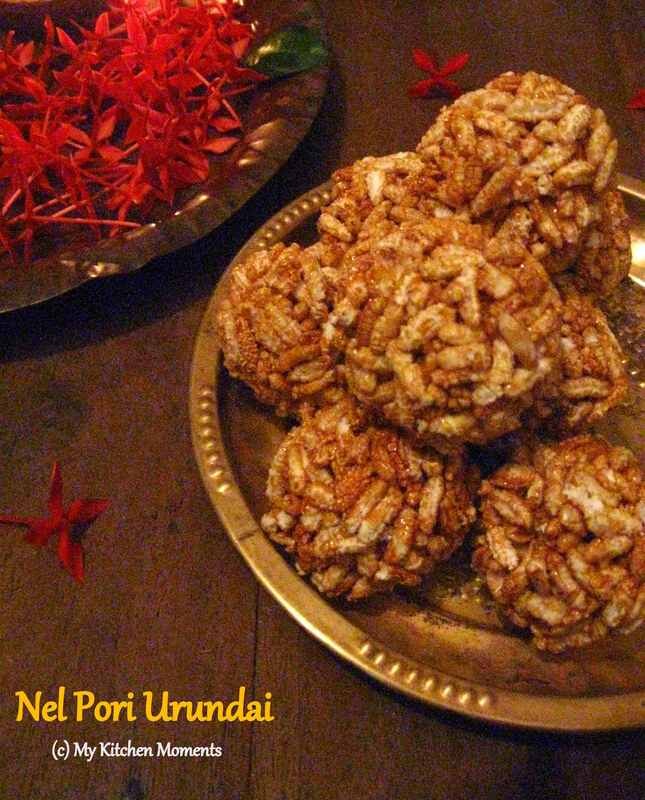 Though Pori urundai is mainly made by using Arisi Pori (called as Puffed rice), it can also be prepared using Nel Pori (freshly acquired rice from paddy fields). Usually Nel Pori is made from fresh paddy rice which is roasted in a clay pot fueled by firewood in a large stove at the backyard of a house in olden days. Karthigai Deepam / Thirukarthigai is a festival of lights, celebrated in the Tamil month of Kaarthigai (November – December) and is celebrated through Tamil nadu. It is celebrated on the full moon day of the Kaarthigai month which coincides with the Krithikai star. It is also considered as the extension of the Deepavali festival. The lighted lamp is considered as an auspicious symbol. It is believed that lighting of lamps will ward off evil forces and usher in prosperity and joy. While the lighted lamp is important for all Hindu rituals and festivals, it is indispensable for ThiruKarthigai. Rows of agal vilakkus (oil lit lamps) adorn the front of every house. My sister and i love to lit lamps in front of our home, and once all the lamps are fully lit, the front of the house just glows. It is this sheer joy in seeing the lamps lit and the glow that comes from the lamps add to the festivity and happiness to the occasion. At home, my sister and i save some of the crackers from Deepavali and burst it during the Karthigai Deepam festival. 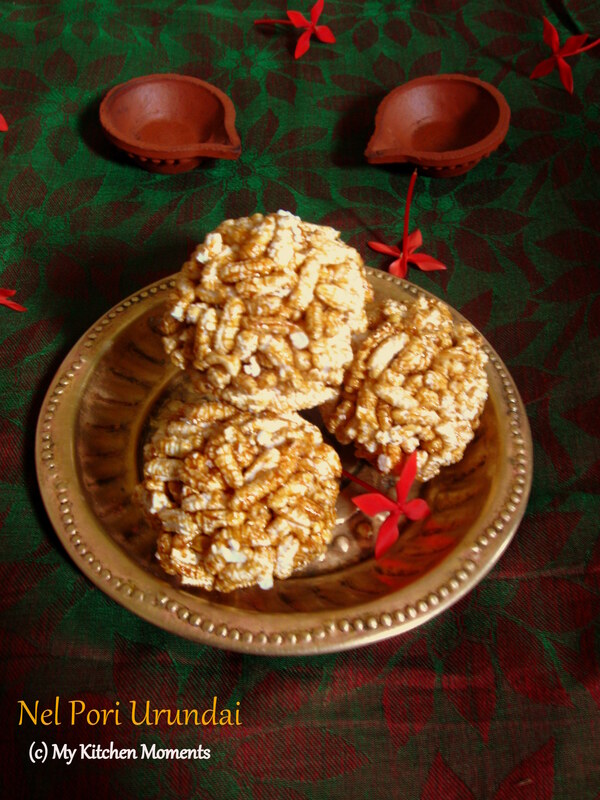 This Nel Pori Urundai is made by mixing the freshly acquired puffed rice with jaggery syrup and ghee, and finally flavored with cardamom powder. It is such a wonderful sweet dish. Sometimes at home, plain Pori Urundai is made without adding the thinly sliced coconut pieces. But the addition of thinly sliced coconut pieces add that extra crunchiness and taste to the pori urundai. I have not added coconut pieces in this preparation, but if you want, you may do so. Remove the nel (the husk) from the pori and keep it ready. In a heavy bottomed kadai, place the jaggery and add 1/2 cup of water to jaggery and heat it up on a medium flame until the jaggery bubbles and dissolves completely. Allow it to get thick and is more of honey like consistency. Strain the jaggery syrup to remove impurities and set it aside. Wash the kadai and put it back on the heat. Pour the strained jaggery syrup back into the kadai and heat it on a medium flame. Allow it to boil until it forms a non-sticky soft ball (uruttu padham) when you roll it with your fingers. In a small bowl of water, pour 2 to 3 drops of syrup in the water. When you take the jaggery syrup from the bowl of water, you should be able to roll it into a ball shaped consistency. Also when you drop it in cold water, it should make a sound while hitting the ground / plate. This is called “Kal Pagam”. This is the right consistency of jaggery syrup for making the urundais / balls. Once the jaggery syrup reaches the desired consistency, put the nel pori, cardamom powder, ginger powder and then and mix well. Switch of the stove. Stir until the pori gets completely coated with the jaggery syrup. Transfer to a plate. Allow it to slightly cool down and check whether you are able to handle the mixture with your hand. Now grease your palm with little ghee, and take a handful of pori and press tightly in between the two hands and form a ball. Repeat with the remaining pori, while the pori is still warm. While rolling them into tight balls, take care not to break the pori. The delicious Nel pori urundai is ready for Neivedhyam (offering to God). And enjoy! Clean the nel pori first and then start with the pori making process. Be careful in checking the consistency of the jaggery syrup, otherwise making the nel pori into balls will be tough. Be little quick while shaping the balls. If it hardens in the end for the last few balls, then heat up the mixture for a minute to loosen the mixture for making the urundais / balls. The color of the pori urundai totally depends upon the jaggery variety. The method is the same for making aval pori urundai and also kadala urundai. I have not added coconut pieces in this preparation, but if you want, you may add the coconut pieces along with cardamom powder. You can store the Nel pori urundai in an air tight container and it will stay good for upto a week. I love the lightng in the first pic!The balls look yummo! Beautiful pictures. like straight from a magazine. Wow! !